Hearts is a great family card game for kids to adults. It's a tricking taking game involving 4 players, where the object of the game is have the lowest score when one person gets more than 100 points. 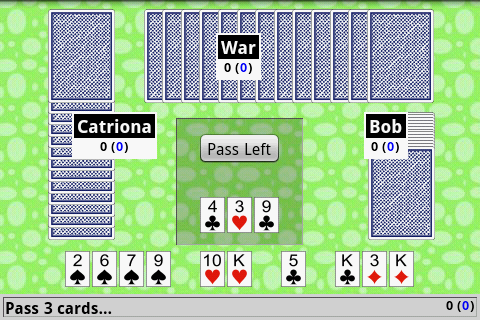 The game starts by dealing 13 cards to each player. Each player passes cards, then plays in sequence, with the objective being to avoid all the hearts and especially the Queen of Spades! Hearts has a new homepage at my software website http://freezingblue.com/hearts/. Visit for more information, including screenshots, a test version and download links. It is also currently available on the Android Marketplace as well as on the Mac OS X App Store. You may have gotten here from an older link looking for Mac OS software. You can find the old download page for Mac PPC, Mac OS X and Windows.